Bribosia, E. et Rorive, I., “Human rights integration in action: making equality law work for trans people in Belgium”, in Fragmentation and Integration in Human Rights Law (Eds. Eva Brems and Saïla Ouald-Chaib), Edward Elgar Publishing Limited, 2018, pp. 111-139. Contrary to how it is often portrayed, the concept of human rights is not homogeneous. Instead it appears fragmented, differing in scope, focus, legal force and level of governance. 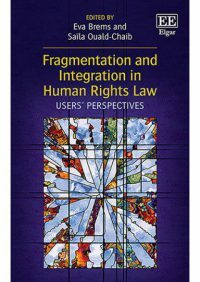 Using the lens of key case studies, this insightful book contemplates human rights integration and fragmentation from the perspective of its users. The fragmentation of human rights law has resulted in an uncoordinated legal architecture that can create obstacles for effective human rights protection. Against this background, expert contributors examine how to make sense – in both theoretical and practical terms – of these multiple layers of human rights law through which human rights users have to navigate. They consider whether there is a need for more integration and the potential ways in which this might be achieved. The research presented illustrates the pivotal role that users play in shaping, implementing, interpreting and further developing human rights law. Offering an innovative perspective to the debate, this book will appeal to both students and academics interested in human rights and the methodological approaches that can be used in furthering its research. Practitioners and policy makers will also benefit from the forward thinking insights into how an integrated approach to human rights could look.